The owner of Segway Aspen, Jeff Soole, rides a Segway in this undated photo. After Soole reached out to Breckenridge officials about expanding his business in Summit County, the town is now moving to ban the vehicles. A result of unintended consequences, Breckenridge is poised to ban electrical personal assistive mobility devices — just call them “Segways” — following an inquiry from an Aspen business owner who’s been thinking about expanding his operation. The inquiry, which ultimately backfired into the proposed ban, came from Jeff Soole, who bought Segway Aspen and its fleet of seven devices earlier this year. After previously supporting the proposed ban on first reading earlier this month, Breckenridge Town Council is highly likely to pass it again Tuesday on second reading. Soole’s idea to expand his business stems from the 38 customers who’ve sent him emails this year alone asking that the Segway-provided tours of Aspen be offered in Breckenridge as well, he said. In an email to town officials, Soole described the business model, saying the Segway tours typically run from about 10 a.m. to 6 p.m. five to seven days a week for no more than four months a year. The tours are led by trained guides, who take guests by various historic sites, multi-million-dollar homes and other noteworthy locations around town while giving them the kind of informational tidbits about theses places one would expect from a seasoned tour guide. In Aspen, an hour-long Segway tour generally runs about 5 miles round trip with tours are divided into beginner and more advanced courses. The most common model of Segway that Soole utilizes for the tours — the Segway x2 — tops out at 12.5 mph and has a range of 12-15 miles per charge. Every rider must sign a waiver and complete a training session proving he or she can safely operate a Segway before heading out. They are not allowed to go off-road or “hotdog” in any way. “The guests seem to really like it,” Soole said of the service his business provides. One of the biggest benefits of a Segway tour, he added, is the wide range of people who can do it. Tours for those with disabilities or the elderly don’t cause any wear and tear on their bodies. Soole didn’t hesitate to put his 60-year-old mother on one, and she loved it, he said. But local officials weren’t quite ready to roll on this one. 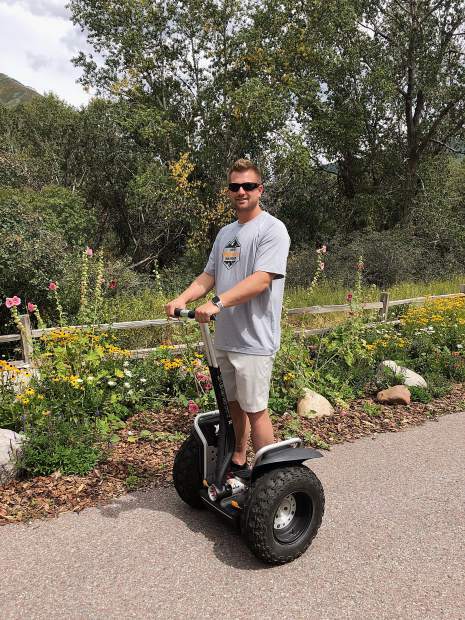 Citing Breckenridge’s already congested streets and other safety concerns, assistant town manager Shannon Haynes quickly nixed any hopes Soole had to grow into Breckenridge, telling him in no uncertain terms the town is not ready to allow Segway tours here. “At this time, the town is not supportive of Segway tours operating in and around Breckenridge and would not issue a license for such operation,” she wrote Soole in an email that was dated Sept. 6 and obtained by the Summit Daily News through an open records request. In his correspondence with the town, Soole also asked what would happen if he and some of his friends wanted to cruise the Breckenridge streets on Segways, not as a commercial enterprise, but as private citizens. “With regard to your second question, today an individual would be allowed to operate a Segway (not related to any business operation) within the confines of state law,” Haynes wrote before mentioning town council would be voting on a ban Sept. 11. That day, as council unanimously voted to pass the proposed ban on first reading, town attorney Tim Berry told council that had Soole pushed for a business license, the town was prepared to push the ban as an emergency ordinance, which would take effect after passage on first reading. Contacted over the phone, Soole said he feels like Breckenridge’s effort to ban Segways is a decision based on fear over fact. While he sees the proposed ban as a heavy-handed effort to control something that doesn’t really need it, Soole isn’t getting bent out of shape over it and won’t push the issue. The ordinance contains some language allowing people with disabilities to continue using other electric mobility devices — such as Rascal scooters — without being affected.